Property Location In the heart of Ocoee, Red Roof Inn Orlando West is within the vicinity of MetroWest Golf Club and Turkey Lake Park. 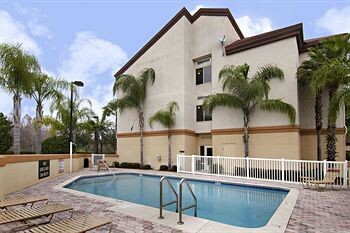 This hotel is within the vicinity of Isleworth Golf and Country Club and University of Central Florida Valencia West.Rooms Make yourself at home in one of the air-conditioned guestrooms. Complimentary wired and wireless Internet access keeps you connected, and cable programming provides entertainment. Bathrooms have bathtubs or showers and hair dryers. Conveniences include desks and irons/ironing boards, as well as phones with free local calls.Rec, Spa, Premium Amenities Take advantage of recreation opportunities such as an outdoor pool, or other amenities including complimentary wireless Internet access and a television in the lobby.Business, Other Amenities Featured amenities include complimentary high-speed (wired) Internet access, a 24-hour business center, and a computer station.